Location is everything when it comes to an outdoor wedding… well, almost everything! When choosing a venue for your wedding, there are many factors to keep in mind. Being from New Jersey, I know that weather is always a factor when planning to do anything outside! Some of the most popular of outdoor venues include the beach, a field, a barn, park, or lakeside. When choosing the right venue for you, consider the elements that come with each venue. What I love most about outdoor locations is the flexibility these spaces give you. With a few decorative touches, you can make your venue unique to you. However, you can plan everything down to the finest detail, and still find yourself dealing with uncontrollable elements the day of. Here are some things to consider when choosing your venue. 2. Consider your guests. 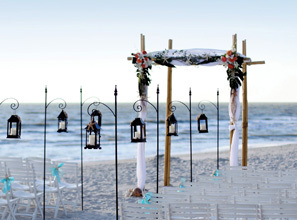 Will a summer beach wedding be too hot or too humid? Would an autumn field wedding be too cold? It’s important that your guests are comfortable and able to enjoy the event, just as much as you will! 3. Weather is a huge factor. It’s impossible to predict the weather a year in advance, but no matter where you are, bad weather is a potential threat to your outdoor event. Choosing a venue with optional indoor space for the day of is a great way to create some reassurance. 4. Choose a season. The best way to choose a venue is to first choose a season. Having a vision of what you want your setting to look like will be helpful in choosing your venue. Also, choosing a season will help determine which pests to prepare for. Summer weddings are prone to issues with bugs like mosquitoes and birds. Make sure that your venue takes precautionary measures. 5. Consider extra facilities. You will want to make sure there is proper lighting for an evening event and restrooms for guests to use. If there aren’t any on the premises, you will need to find outside vendors.